What if you could reduce document storage costs by up to 50%?Your business records hold tremendous operational, ﬁnancial, and legal value. But management of these records—keeping them safe accessible when you need them and securely disposing of them when you don’t—is consuming an ever-growing percentage of your budget. 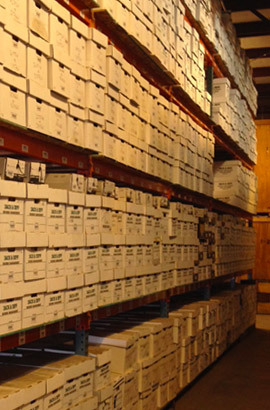 Free up valuable space and resources by storing your records in our highly secure oﬀsite facilities. Maintain a fully chain of custody for your records – from pickup to delivery – via our secure transportation. Implement proactive, legally sound classiﬁcation, retention, and destruction policies that protect your organization from Discovery oversights and prepares you for litigation events. 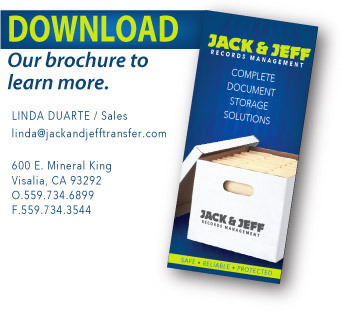 When you outsource your records storage and document management to Jack & Jeﬀ, you’ll beneﬁt from the experience we’ve gained working with thousands of organizations in every industry and of all sizes. As a result, you’ll gain greater control over your document management processes, reduce risk, and control your storage costs. Every business or program must address well-deﬁned objectives which will add value, either directly to the bottom line or toward the achievement of the organization’s goals and objectives.